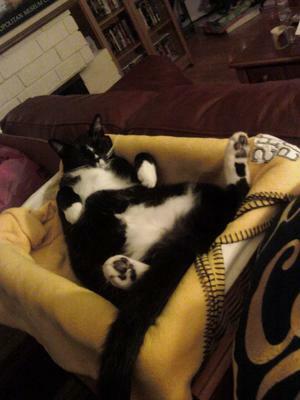 Our tuxedo is now two years old, but even as a 2-month-old kitten, he had quite a personality. I picked him up from the shelter because he minded his own business when I visited his cage, and when I paid him attention, he pawed at me without using his claws. He is very playful to this day. Loves to have food thrown so that he can chase it and eat it. It is a breakfast ritual. He is very friendly, and my sons compare him to Huskies, the Merrill Lynch bull, bulldogs, and basically, just about any animal in the world! (Really, he is a cat.) Plays in boxes. Chases snakes. Very warm and friendly. Social. When there are people in the room, he has to be near them, so he never runs from company, even when there is a houseful of people. We got him with a little female cat, who runs the roost. He is very good with her, and although he occasionally likes to get back at her, for the most part, he is very respectful. I had a cat who looked exactly like yours. I seem to see a white streak on his nose. Mine was extremely intelligent. he passed away after 17 yrs and I still miss him.